Presenting a fascinating overview of medicine in Missouri from the early days of epidemics to present-day technological advances, "Quinine and Quarantine" approaches the history of medicine as an integral part of the state's development. Examining the changing environmental risks and diseases that threatened Missouri over the years and the role of the Missouri and Mississippi Rivers as prime routes for the spread of diseases and innovations, Loren Humphrey discusses the efforts of citizens, legislators, and health officials confronting various medical challenges. He offers intriguing medical details of the past two centuries interspersed with the stories of significant historical figures and Missourians' personal accounts. He tells of the pioneers' struggles to use natural remedies acquired from Native Americans, the gory and unsanitary attempts to treat early gunshot wounds, and the common afflictions and diseases such as "swamp fever," measles, mumps, consumption, dysentery, smallpox, and typhoid that seemed beyond medicine's effects. Humphrey also discusses the significance of the discovery and reluctant acceptance of the "antifever" breakthrough now famous as quinine, as well as the lessons learned as a result of Civil War medical techniques. "Quinine and Quarantine" takes readers on a remarkable journey that concludes in the present, arguably the most exciting and controversial era for medical advances. Humphrey explores new imaging techniques, laparoscopic surgery, and research on ways to overcome bacterial resistance to antibiotics. He challenges the reader to consider such compelling issues as the escalating cost of health care and the threats posed by environmental hazards. He also identifies topics over which Missourians will likely struggle well into the next century, such as transplants, managed care, abortion, and assisted suicide. 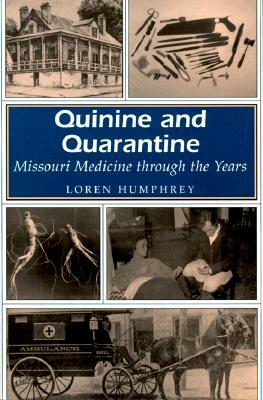 Organized chronologically in fifty-year segments and written in language free of jargon, "Quinine and Quarantine" offers readers a broad historical view of the medical problems and solutions faced by the people of Missouri, preparing them to cope with medical issues of the new millennium. Description: Presenting a fascinating overview of medicine in Missouri from the early days of epidemics to present-day technological advances, Quinine and Quarantine approaches the history of medicine as an integral part of the state's development. Quinine and Quarantine takes readers on a remarkable journey that concludes in the present, arguably the most exciting and controversial era for medical advances. Humphrey explores new imaging techniques, laparoscopic surgery, and research on ways to overcome bacterial resistance to antibiotics. He challenges the reader to consider such compelling issues as the escalating cost of health care and the threats posed by environmental hazards. He also identifies topics over which Missourians will likely struggle well into the next century, such as transplants, managed care, abortion, and assisted suicide. Organized chronologically in fifty-year segments and written in language free of jargon, Quinine and Quarantine offers readers a broad historical view of the medical problems and solutions faced by the people of Missouri, preparing them to cope with medical issues of the new millennium. Loren Humphrey has published more than 160 scientific articles. He is the author of Medical Blemishes, a book of short stories, and, most recently, a historical fiction novel based on the lives of three women with cancer. Now retired, Humphrey has served as Professor and Chairman for the Department of Surgery at the University of Kansas, Professor at the University of Missouri-Kansas City, Professor and Chairman of Surgery at Oral Roberts University, and Professor of Surgery at the University of Missouri in Columbia, where he currently resides.